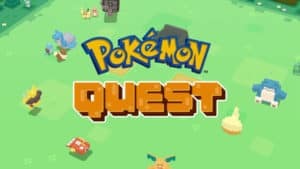 Pokémon Quest Heads to Mobile Next Week | Nerd Much? Towards the end of May, The Pokémon Company hosted a press conference which announced that four new Pokémon games were headed our way. One of those titles was Pokémon Quest for the Nintendo Switch. It launched that very same day. When Pokémon Quest was unveiled, it was confirmed that the game would be headed to mobile devices sometime soon. According to the official Japanese Pokémon Twitter account, “sometime soon” is now next week. The game will be playable on both iOS and Android devices. A listing has shown up on the Apple App Store that indicates we could be in line for release on Thursday, June 28th. The game is still a free download just as it was on Switch, but sadly there looks to be no way to share data between the mobile and Switch versions. You’ll have to start completely fresh to play Quest on iOS. Pokémon Quest is a new title that features cubed versions of the original 151 pocket monsters. You’ll capture various monsters as you attempt to flesh out your Pokédex. Your party will consist of three Pokémon, with the creatures moving themselves while you handle attacks during battle. The gist of the game is that as a trainer, you lead your squadron of Pokémon around the locale known as Tumblecube Island. Here, you’ll collect Power Stones and other forms of treasure as you traverse the island’s various stages. You can power up your Pokémon with these items, making them stronger in battle and enabling evolutions. Players have a Base Camp to call home in the game too. You can decorate your Camp to your liking and also cook up various recipes that lure additional Pokémon toward your Camp for capture. While the game is free-to-play, there are various ways that you can throw money at it to advance quicker. The majority of those are entirely optional though. If you haven’t given the game a whirl on Switch, it looks as though you’ll have your first crack at it on your mobile devices next week. For more Pokémon goodness, checkout Nerd Much’s recent article explaining why the series is killing it in 2018.